NEW YORK, October 25, 2017 /3BL Media/ - The Citi Foundation today announced the launch of the Youth Workforce Fund as part of its Pathways to Progress initiative to provide youth both in the U.S. and around the world with training and access to jobs, including paid apprenticeships and internships. In partnership with America’s Promise Alliance, 15 nonprofit organizations across the United States will expand their programming to provide a range of employment opportunities in various areas including environmental sustainability to robotics and culinary arts to coding. Collectively, the Youth Workforce Fund is expected to reach more than 5,000 youth across the country. Access to apprenticeships, internships and vocational training is essential to empowering youth and preparing them to compete in today’s economy. 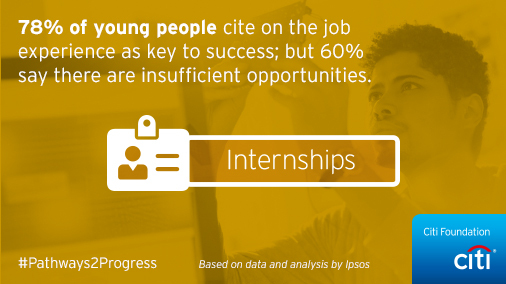 According to the Citi Foundation’s Global Youth Survey 2017: Economic Prospects & Expectations, 78% of young people surveyed believe that internships and apprenticeships are critical for career success; however, 60% say there aren’t enough of these opportunities in their cities. The Youth Workforce Fund is comprised of leading community organizations from 15 U.S. cities including Buffalo, NY; Chicago, IL; Dallas, TX; Florence, KY; Jacksonville, FL; Los Angeles, CA; Miami, FL; Newark, NJ; New York, NY; San Francisco, CA; Sioux Falls, SD; Tampa, FL; Tucson, AZ; Washington, DC and Wilmington, Delaware;. Each organization is receiving $250,000 in financial support in addition to technical assistance and an opportunity to share best practices. Buffalo, NY: Say Yes to Education Buffalo matches youth with paid internships at local businesses and organizations in Western New York and offers career readiness workshops. Chicago, IL: Mikva Challenge hires Chicago youth to work with community leaders, school administrators and city officials to identify and help solve pressing issues facing youth in the community. Dallas, TX: Café Momentum provides paid internships, intensive culinary job skills training and ongoing mentoring for youth in preparation for full-time employment. Florence, KY: Cincinnati Youth Collaborative’s (CYC) mission to empower vulnerable students to overcome obstacles and succeed in education, career and life. CYC’s Work Readiness program, Jobs for Cincinnati Graduates, provides high-school students core employment skills, enrichment experiences, community service activities and access to 8-week paid internships. Jacksonville, FL: United Way of Northeast Florida provides job readiness training, mentorship and exposure to careers matching youth’s talents and interests and then places them in paid internships amongst its network of local employers. Los Angeles, CA: Los Angeles Conservation Corps provides youth paid work experience; industry recognized certifications, and training and education in the field of environmental sustainability with an emphasis on conservation and service projects that benefit the local community. Miami, FL: Youth Co-Op equips youth with soft and hard skills through workforce readiness training and connects them to full- or part-time employment and internship opportunities that meet their interests and the needs of the local labor market. Newark, NJ: Jersey Cares places youth in incentive and performance based internships within the Newark nonprofit sector, where they use corporate sponsored workforce skills training to help lead programs and projects in their communities. New York City, NY: The Opportunity Network facilitates a rigorous career readiness Fellows program, connecting youth to employability curriculum, mentors, knowledge of careers that fit their skills and interests, and paid summer internships in addition to college access and persistence supports. San Francisco Bay Area, CA: The Bay Area Council Foundation supports the Council’s Workforce of the Future Initiative focused on connecting opportunity youth and middle-skilled workers across the region with major employers through groundbreaking partnerships with educators and community based organizations – helping close the skills and opportunity gaps in the regional economy. Sioux Falls, SD: Southeast Technical Institute equips youth with skills training that is in line with local industry needs and assists them with securing paid internships and apprenticeships to prepare them for a dynamic and rewarding career. Tampa, FL: Career Source Tampa Bay provides youth with pre-vocational training and industry-recognized certifications for in-demand careers such as welding, soldering and cabling, mechatronics and robotics, hospitality, and construction and then connects them to employment opportunities, including paid work experience, internship, on-the-job training, and apprenticeship. Tucson, AZ: Tucson Urban League connects youth with technical training, industry-recognized credentials and paid internships in Tucson’s burgeoning industrial aviation technology, biotechnology, automotive technology, and building/construction sectors. Washington, DC: Urban Alliance offers intensive, year-long career development program for high-school seniors in underserved communities that includes professional development training, mentoring, and paid internships in the corporate, government and nonprofit sectors. Wilmington, DE: West End Neighborhood House matches youth with paid work opportunities that align with their aptitudes and interests in various industries including Agriculture/Horticulture, Culinary Arts, Customer Service, Information Technology, Construction and Early Childhood Education. Visit the Youth Workforce Fund website to learn more.